Not Convinced you need to bother writing a craft business plan? Here's why writing a good plan is worth your time. Plus, how to get started on your own plan. A craft business plan can help you get your new business off to a stolid start whether you're opening a small, part time business from home, or you're launching a larger venture and taking on more risk. In creating your plan, you'll examine all of the strengths that will help your business succeed and the challenges that you'll need to overcome. You'll create a financial plan that will help you to see your likely expenses over time, and you'll create a road map for building your business. 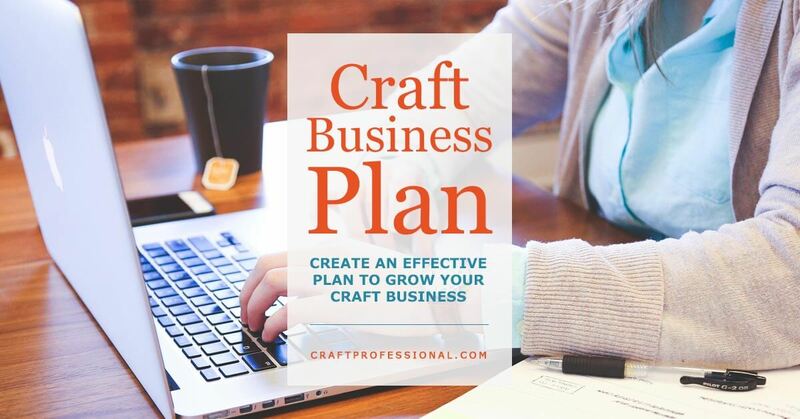 The thought of writing a business plan may feel overwhelming, but with the right resources and some good, focused work, you can get your business off to the right start with a practical craft business plan. Do you have a business plan, or did you jump into your new venture without a road map? A lot of people jump in without planning. One of the beauties of starting a craft business is that you can do it with a small degree of commitment and risk. Many craft businesses get started from home, on a small budget, and as a side project or an extension of a hobby. For the most part, new craft professionals are not out applying for hefty business start-up loans, renting commercial space, or hiring full time staff. Because it's possible to slide into a craft business without a huge commitment of expense, and there's often no need to justify your business to outside funders or landlords, there's also often little to no business planning in the beginning. As time passes, if you're lucky, you get busy, and then it feels like there's no time for planning. But craft professionals can definitely benefit from some smart business planning. You probably don't need to validate your business idea to outsiders; however, you are committing your own precious resources - your time, and your money - to grow this business. Isn't it worthwhile to asses and validate your plan for yourself before you make that commitment? Back in 2006, when I launched my own business, I wrote a traditional business plan because I was forced to write one. I wrote my plan without fully buying into the process. I only did it because I had to. I was very lucky to be a part of a small business development program that provided me with business-building resources, training, mentors, and some funding. One of the requirements of the program was to write a business plan. I got some benefit from writing my first craft business plan, but I would have gotten a lot more out of it if I had approached it as a project I was doing for myself and for the good of my business, as opposed to a document I had to write in order to satisfy someone else's requirement. I planned out a full year of goals and sales strategies. At the time, there weren't as many opportunities for selling crafts online (I also knew nothing about promoting an online business back then), so my craft business plan hinged primarily on selling at home parties and craft shows. You have to plan far in advance to sell at craft shows. Applications are due many months before the actual show. It makes sense once you think it through, but if you've never thought about selling at craft shows, the amount of advance planning required can come as a surprise. Creating a business plan ensured that I researched shows in my area, determined the ones I wanted to apply to, submitted applications on time, and also attended shows with application deadlines that I had already missed to see what I could learn from watching other craft professionals in action. Applying to sell at craft shows is a time-sensitive task, and good planning helped me avoid missed opportunities. During my business planning, I realized that because of the time of year I started my business, it would be nine or ten months before I might be able to sell at any larger shows. That fact caused me to research and experiment with alternatives such as smaller shows, home parties, consignment, and online sales. Another fact about craft shows that seems obvious now but was a big surprise starting out was the fact that you have to pay for your booth space many months before the actual show. If you're accepted to a few juried shows, you'll probably see several hundred dollars in booth fees coming out of your bank account in the spring, long before you've had a chance to sell your product. Writing a craft business plan forced me to predict my cash flow over the course of the first year of my business, so I was prepared for those costs. Without planning, the timing of those expenses could have come as a big, unpleasant surprise. In writing my business plan, I had to assess competition. I'm grateful that I was required to do this research because I might have otherwise avoided it out of some misguided sense of honor. Craft professionals are frequently warned away from looking at people with similar businesses, as if it's unethical. Assessing your competition is a necessary part of planning a business strategy. Certainly, you don't ever want to outright copy someone else, but looking at what others do well, and where they are missing opportunities is an important step in developing your business. It will help you to determine what unique value you can bring to your niche that others do not. When your business is new, it is immensely tough to predict your income. You just don't have the data you need to make accurate predictions, and it's not something you can easily research online. I had no clue what was reasonable. I was so drawn to the idea of selling at juried shows, I didn't realize that, in the early days, home parties would be my best source of income. I also hadn't considered the real possibility that you can sell at a show and just break even, or even lose money. Thinking through and trying to predict my income potential was worthwhile, but I was wildly off base. It's fairly typical for new business owners to have a hard time accurately predicting income in the first year. You just don't have the data to back up your assumptions. Once your business has been up and running for a while, it's generally much easier to predict what you'll make from month to month. Luckily, my business mentors knew my predictions were way off base. "Optimistic" was the word they used. I think they were trying to be kind, but, with their input, I knew I shouldn't depend on the amount of income I had predicted for that first year. Everything takes so much longer than you realize when you do it all yourself. That's one of the lessons I've learned with self employment, and I still have to remind myself of that fact. When all of the tasks are done by you, and you are starting everything from scratch, and often learning as you go, it all takes time. My predictions for reaching certain milestones were way off base in my first year in business. I looked at my craft business plan as a document I had to write to satisfy someone else's requirements, not a road map to help me think through and plan for my first year in business. I got caught up in fulfilling someone else's requirements instead of focusing on the overall purpose of writing the plan in the first plan. I was completely focused on wondering what the heck is an executive summary, and how am I supposed to do a market analysis. My focus was on just creating the document, when it should have been on creating a plan that would guide my first year of business. You probably don't need to write a business plan to satisfy others. That kind of business plan is really only necessary if you're seeking funding to launch your business. That's great news. It means you can create a plan for yourself. A well-written business plan will require you to look at your business idea in enough depth to determine if it has a good chance of success. It can also help you to envision the future of your business to determine if it is truly the business and life you want to build. I mentioned earlier, I had the benefit of business mentors to help me get my business launched. Not everyone has that luxury, but there are plenty of resources available for new business owners. A visit to your closest US Small Business Association (SBA) is a smart place to start (For readers outside the US, look for a small business development organization or Chamber of Commerce in your area.). They also have some fantastic resources online to help you develop your own business plan. In addition to working with business mentors, I also used The Successful Business Plan by Rhonda Abrams to guide me through everything I needed to know when I wrote my first business plan. It has been updated since I first used it and now includes new information about social media and technology related to business development. This book is immensely thorough. If it's related to business planning, and you need to know it, it's in this book. The Successful Business Plan is written in clear, easy to understand language, but it is extremely detailed. That means, it will take time to work through everything that's relevant to your business, but the task is achievable. 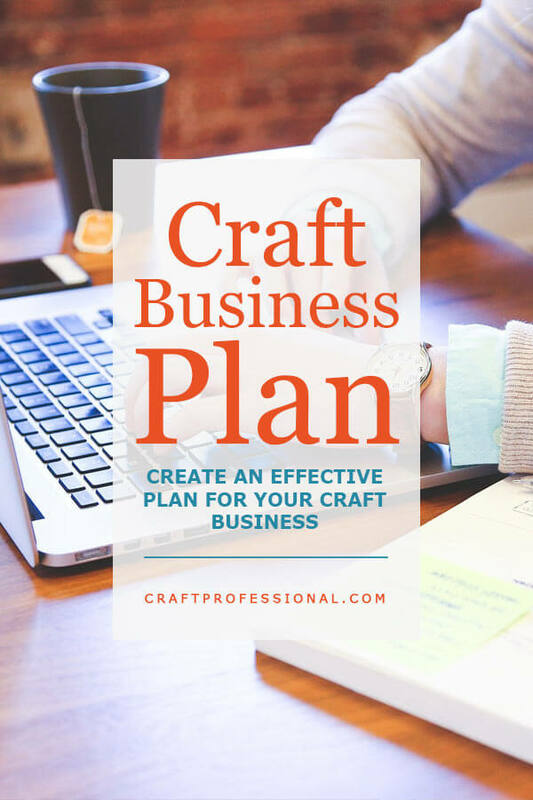 Developing a craft business plan that is a well-researched, functional road map for your business will take time. This is not a quick, afternoon project, but if done well, it will repay your time spent many times over. A good plan can prevent you from making mistakes, help you avoid ill-advised business strategies, and ensure you don't miss out on important opportunities.